Your Adventure Ends Here, Again! In AFF2e PCs and Monsters have a SKILL score, which for PCs ranges between 4 and 12. PCs also have Special Skills, for example Sword, which range from 1-6, which are added to the SKILL score in appropriate situations. This can, eventually, produce PCs with ‘effective’ SKILL scores way beyond 12 - though a starting 'warrior' PC will likely have an effective SKILL of 9 (SKILL 7 + 2 points of Special Skill) when using his or her favoured weapons. 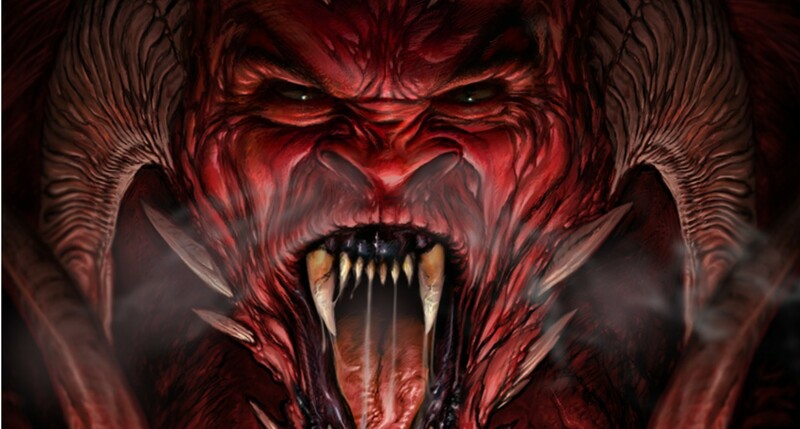 The monsters in Out of the Pit were given SKILL scores to provide a challenge to a single gamebook PC with an SKILL score of 7-12. This means that most starting PCs geared towards fighting are at the same effective SKILL level or better than most humanoid monsters. Even a Lizard King is only SKILL 9. Combat in AFF is resolved by generating 'Attack Strengths' by rolling 2d6 and adding effective SKILL, with the character with the higher Attack Strength doing damage to the STAMINA of the loser. Differences in effective SKILL can be understood as modifiers to the 2d6 roll; a PC with an effective SKILL of 14 has, essentially, a +7 modifier to a 2d6 roll off vs a SKILL 7 Great Orc. Modifiers have a quite dramatic effect on the distribution of results on a 2d6 bell curve, so just a few points difference in effective SKILL can settle a fight. The effect of all this is that PCs with just a few sessions' worth of Experience Points (EPs) spent on SKILL and a weapon Special Skill are BAMFs. Now, there is nothing wrong with PCs being BAMFs. Don’t misread what I wrote in the PatheticAesthetic – I was explicit that in Fighting Fantasy gamebooks YOU are often one of the most dangerous things on Titan – there is a 1 in 6 chance YOU would have SKILL 12, after all. But YOU are always a poor decision, or a Test Your Luck, away from your doom. In an adventuring party, containing several starting characters with the combat capabilities of a Lizard King, and with characters growing progressively more powerful (neither of which is part of the original gamebooks), the PCs are at risk of outstripping the power level of the world. What I am trying to do is find a way to accommodate the BAMF that AFF2e produces while retaining the risk, danger and peril that is found in every corner of Titan over the course of a long-term campaign. And I would rather fiddle around the edges of the AFF2e system than toss out the monster stats from the brilliant Out of the Pit. So, I’m not proposing messing with the AFF2e experience point and advancement system. Players, if they choose, can still end up with a PC with SKILL 12 and pour all their remaining EP into getting Special Skill Sword up to 6. The advice in the rulebook is that between 30-40 EP should be given to each PC for the average 3-4 hours of play. Now, while it might take 1000 EP (25+ sessions of play) to go from SKILL 7 to SKILL 12, going from Special Skill 2 to 6 is a matter of just 180 EP (5 sessions of play). So, while the effective SKILL 18 munchkin is the best part of a year of weekly play away, it is likely that combat orientated PCs will have effective SKILLs of greater than 12 within a modest number of sessions. I am proposing that, no matter what effective SKILL score might be arrived at by adding SKILL, Special Skills and circumstantial modifiers, for the purpose of SKILL tests or generating Attack Strengths the maximum effective SKILL is capped at 12. So in a situation with no modifiers, a PC with SKILL 11 and 1 point of Special Skill Sword has an identical effective SKILL as the munchkin Sword Master with effective SKILL 18 described above. If they are fighting each other, they both roll 2d6 and add 12. Essentially, each round is a 2d6 roll off. This means that when the Sword Master comes up against a SKILL 7 Orc, he has, in effect, +5 bonus to his Attack Strength, rather than the +11 bonus ‘uncapped’ effective SKILL would produce. This keeps combat (and Skill Tests) dangerous. But why become a master in a Special Skill? Why spend all those EP to become a 'Skill Master'? Because in actual game situations need not (and rarely should) be straight forward duels in perfect conditions. There are plenty of factors that can produce negative modifiers. Do note: I am applying these modifiers to the effective SKILL, not to the 2d6 roll***. This means that the Sword Master described above can take a -6 modifier and still have an effective SKILL of 12. Meanwhile, his opponent, who in perfect conditions also has an effective SKILL of 12, fights with an effective SKILL of just 6. So, when fighting in the dungeons beneath Lord Azzur’s palace, the Sword Master can extinguish the lantern and fight in absolute darkness. This will mean, with the -6 modifier for fighting in darkness, he will still have an effective SKILL of 12. His opponent, Azzur's captain of the guard - SKILL 12 - is reduced to an effective SKILL of 6. And the simplest way to understand this at the table is to think of it as a +6 bonus to his 2d6 roll of the Sword Master. And, having defeated the captain, when fighting up the narrow spiral stairs, he can easily shrug off the -3 modifier to his effective SKILL. In other words, those with an effective SKILL of over 12 are able to cope with conditions that would defeat the ordinary man or woman (or Dwarf, Elf, or Rhinoman). Skill Masters can also make easier use of the combat options that apply a negative modifier to their effective SKILL. So those with an effective SKILL of over 12 can more easily go on an 'All Out Attack' (-2 to effective SKILL to add +1 to the STAMINA damage caused) or a similarly 'munchkinned' archer could fire two arrows each round using the 'Rapid Shot' option, even in poor conditions, without compromising his or her effective SKILL. These rules should also be applied to non-combat situations. However, this is much less important for my games, as I am thinking of doing away with opposed SKILL tests in non-combat situations. I'll write about that, and the virtues of 'asymmetry' in AFF2e in my next post. ***This is an important change. Modifiers that are, as per the rulebook, assigned to the combat total/Attack Strength are instead assigned to 'effective SKILL', which is calculated before the 2d6 rolls. And as described above, differences in effective SKILL can be simplified to a simple modifier to the 2d6 roll for the character with the advantage. Now, in this system it matters whether a condition abstracted into a modifier is represented by a bonus or a 'malus' (negative modifiers). Bonuses are of little use to those with already high effective SKILL if it is capped at 12, but on the other hand they are able to absorb the effects of any malus. I wondered if, with this in mind, all modifiers should be negative (only fighting down steps, outnumbering, and a rear attack give bonuses) but I figured that I would keep positive modifiers for two reasons. One, so that I can use the table in the rulebook, and so can my players. But two, so that being outnumbered would still be a frightening experience. For example, Six Goblins (SKILL 5) attacking a Sword Master would each have an effective SKILL 10 (+1 for each extra opponent). The Sword Master would still fight at effective SKILL 12 (effectively a +2 bonus to the 2d6 roll), and could 'spend' up to 6 'points' in 'All Out Attack', or find other ways to apply negative modifiers to the effective SKILL of all combatants, in order to make use of his supreme munchkinned mastery. By comparison if outnumbering was abstracted into a 'malus', the Sword Master would still have an effective SKILL of 12, and the Goblins would each have an effective SKILL of 5, effectively giving the Sword Master a +7 bonus to his roll (and that is with 'effective SKILL capping) making for a far less interesting situation. FINAL NOTE: Only PCs have their effective SKILL capped at 12. Monsters in Out of the Pit with a SKILL of greater than 12 are not capped in this way. These kind of monsters are rare indeed, being Demons, Elementals, Dragons and the like (even Giants are 'just' SKILL 10). Human(oid) PCs are not meant to beat these creatures in a straight stand-up fight, and indeed in the source material YOU are rarely expected to do so. The key is always to find the MacGuffin, the special weakness, or come up with a cunning plan to circumvent the sheer power of these monsters. The lair of the Demons is guarded by a terrible device: a large swinging pendulum blade, which even now plunges deep into your forehead. Your adventure is over. Okay, I've skipped on a few books since I last recorded my 'choose your own death by misadventures'. I'd dutifully recorded the demise of my various characters until I kind of ran out of steam last summer with #18 Rebel Planet. I was never much of a fan of the non-fantasy FF books - they just didn't have the verve or inventiveness - the character - of those set on Titan. Shortly after that we began playing The Crown of Kings for Advanced Fighting Fantasy 2e, so I got my fill of Jacksonian trickery by inflicting it on my players. 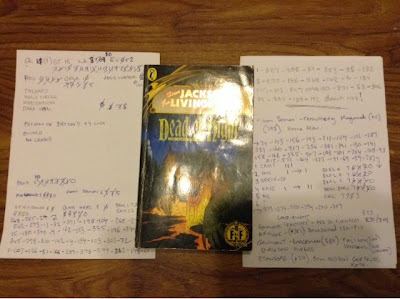 I did play the *other* Steve Jackson's Demons of the Deep (#19). Unfortunately, one year on from my sub-marine adventure the best I can remember of that was that it had an interestingly 'sandboxy' structure (as does 'not the real' Steve Jackson's Scorpion Swamp), but that, despite the fact that a Merman spa had raised my SKILL to superhuman levels - allowing me to defeat a Kraken in single combat(!!) - I failed in my mission. For some reason, I had set myself the task of killing Captain Bloodaxe by the end of the day. Ambitious. So that the adventure ended in unsatisfying non-death defeat. 'Oh, woe is me', my character wailed, before realising that he was nigh-on the incarnation of Courga, and that he could always kill Captain Bloodaxe tomorrow. And cut a bloody swathe across Titan; and unto this, YOU, destined to wear the jewelled crown of Salamonis upon a troubled brow. But back to Dead of Night, a very good gamebook set in Gallantria, a northern kingdom of the Old World. I had never played this before, as 'back-in-the-day' my Fighting Fantasy collection only ran to the mid-thirties. I know that I owned #35 Daggers of Darkness. No-one forgets that cover. In Dead of Night YOU play a renowned Demon-Stalker, a Templar from the Sacred Citadel in Royal Lendle. Demon-Stalkers make enemies, and YOU have made an enemy of Myurr, the loathsome Frog Demon. He has done... something to your parents, and YOU are off to find out what. I played this gamebook twice. The first time through I had a SKILL 11 Templar as my hero, but managed just 25 sections before meeting my doom, as above. A failed Test of Luck, of course. I thwarted no major evils, though I did manage to defeat a Vampire with a bit of holy symbol action. In my second attempt I rolled a SKILL 9, STAMINA 15 and LUCK 8 hero. Not a character likely to see section 400, for sure, but this time I got much further. After defeating Calbert the Vampire once again, this time I read the map correcting and found my old ally Sharleena (whose name sounds a bit too much like Shareella, the Snow Witch, for my liking). Unfortunately, while I was sipping hot wine in an anteroom, she accidentally summoned a Spirit Demon. Luckily, this isn't a book full of Livingstonian SKILL 12 monsters, and even with modest attributes I had the edge on the horror. With her last ounce of life, the dying seer scrawled 'N' on the floor in her own blood. North it is then. But they shouldn't have messed with me. Even at SKILL 9, I escaped the slave cart, found my way to Colton-on-the-Marsh, and cut my way through zombies to defeat bone-crowned Magrand the Necromancer, who was collecting the patrons of the Inn for his 'experiments'. Leaving the Colton a hero and continuing north, I almost immediately came across a Moon Demon reincarnating Magrand. They wouldn't let him lie, would they? Despite the undead Magrand having SKILL 10, I killed them both. I then saved friendly old Tom Hickson and his family from Skeletons, before accepting a ride on a barge up river to Axmoor. Axmoor, scene of Geiger-esque nightmares, where human sacrifices were fed into the furnaces of a 'pyramid of bone' [edit: the 'pyramid of bone' is something else - the visions of the fortune teller on the barge misled me - this atrocity is known as a 'Land-Blight'] a factory that belched poison gas, terraforming Titan for Myurr's demonic armies. This was a great encounter, one that I did not expect in the slightest, full of biomechanical weirdness that I'll have to add to the ingredients of my next RPG session set in Titan. Well, who can blame me for assuming that this was the final battle, and I threw everything into destroying the Death-Stone, the 'seed' from which this canker had grown. All my Holy Water, all my magics, but it was enough. Oh, but that's *not* the end? No turn to 400? Bugger. But I did 'level up', gaining a SKILL and two LUCK points. On to the final battle(?) then, at Dunningham, where an agent of Logaan, the Trickster (everyone's favourite God) helped me see through the illusions of Myurr and offered me some advice. But it was all for nought, as I was caught in the gaze of the Baleful Eye. If the tower is not on fire, you are set upon by hundreds of Orcs. Although you sell your life dearly, you are bound to succumb to the attacking hordes. The forces of Evil have triumphed. Despite having a wealth new games to play (or never play, but admire, and the same old suspects are wheeled out again and again), I often find my thoughts turning to the world of Titan, and Fighting Fantasy in general. A couple of days I read an old blog post, which I cannot now find. 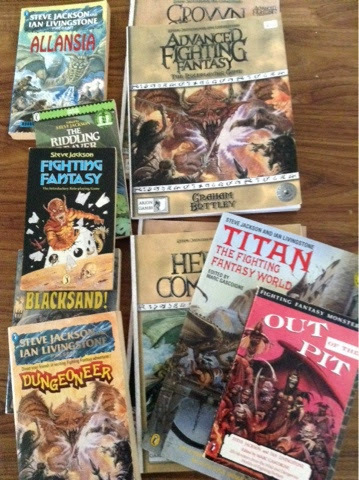 In that post, nostalgia for FF gamebooks was tempered by the assertion that you couldn't get kids these days to play these books when they could be smashing things to bits in [Insert Current Game Title Here]*. And I think that assertion is, sadly, more or less true. 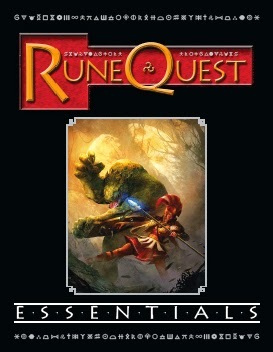 But a fantasy adventure gamebook does things in a different way to a viscerally thrilling fantasy adventure video game. And in that difference there is a virtue that we should remember when playing roleplaying games. FF combat is boring. It is boring because there are no choices (most of the time). Roll dice until one side wins, with not even the possibility of retreat, is not uncommon. This means that the whole thing could be settled by a single dice roll, the probability of victory being fixed the moment the encounter begins. It'd lose some tension, sure, but the end result, mechanically speaking, would be the same. So where is this virtue, eh? Well, mechanically boring combat is feature, not a bug. By having such boring combat and task resolution, FF gamebooks remind me of the things that roleplaying games can do better than video games. Roleplaying games can never match the complexity of micro-choices about the system that are the focus of many (not all) video games - ability to master the controller and the powers and abilities of the character. And if we use a system that wasn't put together by designers worrying about that, the actual play of a roleplaying game will by necessity focus on the choices being made in relation to the game world rather than the game system. And while a gamebook has the same 'dead' GM as a video game, in a tabletop RPG this perspective can be taken to the extremes, with truly open worlds existing in living imaginations rather than fixed on paper or in code. So thank you Fighting Fantasy - I glad that you were my introduction to fantasy adventure gaming and not [Insert Video Game Title Here]*. *I am out of touch, but not that much. I could have named a video game - probably one that I have enjoyed tremendously - but I don't want to make this about that particular video game. This isn't about denigrating video games. But simple systems force the play(choices) to be about the world, while a complex system allows the play(choices) to be about the system. So, we all know by now that there is this new version of an old game out. By all accounts it is pretty good, combining the best parts of the older editions with some new thinking, before streamlining the whole thing to produce a game that plays much like the traditional editions while having the modern chrome required to attract new fans. And surely we also all know that while you can buy an expensive, well produced hardcopy version of the rules, there is also a free .pdf of the core of the rules - the basics, or essentials if you will, that put a perfectly playable version of the game in your hands. And with this one, I don't think that anyone could moan about the cover art.